For members of our Military with domestic APO/FPO/DPO addresses, they can fill out the same Change of Address (COA) form (PS Form 3575) that is filed for a domestic mail forwarding request. This form can be found at any local post office. Note that for military addresses, the COA form cannot be submitted or revised online and must be filled out at the post office. 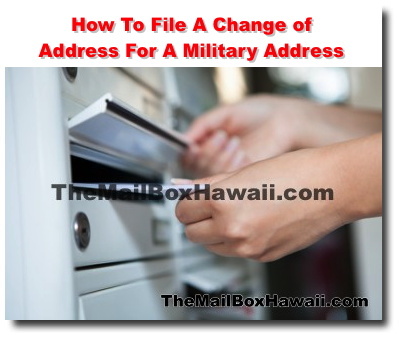 Mail is forwarded at no additional charge for individuals serving int he United States Armed Forces (household members and including civilian employees) when their change of address is due to official orders. This applies for all Priority Mail Express Service, First-Class Mail, First-Class Package Service, Standard Post, Periodicals, and Package Services. For official change of station orders to overseas address, the military will forward mail between the United States and those addresses (APO / FPO / DPO) and is limited to 60 days. Note that Military ZIP Code restrictions may change as military units move to different locations.